Did you know that Thomas Jefferson was so enamoured with waffles that he had an iron shipped from France to Monticello so his guests could sample the Brussels and Liege versions he so enjoyed. While Belgium has been famous for waffles since the Middle Ages it's interesting to note there are no Belgian waffles made in this small country. The Belgian waffle is an American creation that was introduced at the 1964 World's Fair where it was called a "Bel Gem Waffle". The American version is actually patterned after the Brussels waffle but it's leavened with baking powder rather than yeast and beaten egg whites. 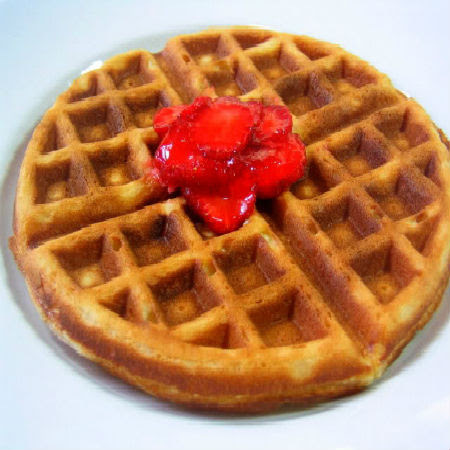 Following the World's Fair waffles became a craze and the waffle iron proudly claimed a spot in most American kitchens. Do you remember the light, dense and delicious waffles of Sunday night? Chances are they were made with a baking mix and made it to the table with little effort and less forethought. Their Brussels and Liege counterparts aren't quite that easy. They both require yeast or a sponge and won't get to the table on a whim. 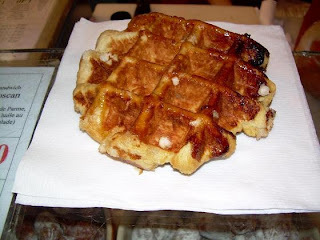 A true Liege waffle is made with chunks of sugar, which caramelize and form a crispy, crunchy coating. In Belgium, waffles are sold in waxed wrappers and eaten like a street food. They are usually not eaten for breakfast and are considered to be a snack or dessert food. Are they better than their American counterpart? That's for you to decide. I'm including recipes for Brussels and Liege waffles; I hope you'll try them when you have some time. Somethings beg to be tried before we die, put Liege waffles on your list. 5) Preheat waffle iron. Brush with oil and spoon about 1/3 to 1/2 cup (or as recommended by manufacturer) inside edges of iron. Close lid and bake until steam no longer escapes from iron and waffle is golden brown. Serve immediately or keep warm in 200 degree oven. Yield: 8 waffles. 1) In a small bowl, sprinkle yeast over the milk. Add 1 tablespoon of flour and sugar; set aside for 5 minutes or until foamy. 2) Sift remaining flour into a large mixing bowl. Make a well in center and add yeast mixture and egg. Stir well to make a smooth batter. 3) Cover with plastic wrap; set aside in a warm place and let rise until doubled or tripled in bulk, about 2 hours. 1) Place butter, flour, vanilla, baking powder, salt, granulated sugar, and pearl sugar into a bowl and work with back of a wooden spoon to form a paste. 2) Work butter mixture into sponge mixture until well combined. Cover, and set aside for 10 minutes. 4) Heat a waffle iron until medium hot. Place a flattened ball in the middle of the iron; close top. Cook for 3 to 4 minutes. If waffle iron is too hot, sugar will burn. Continue baking until all the waffles are done. Waffles may be kept warm in a 200 degree F. oven until ready to serve. Yield: 10 waffles. Cook's Note: Pearl sugar, also called hail sugar because it is similar in size to hail stones, can be purchased in a well stocked super market. If unavailable you can make your own by crushing sugar cubes till they resemble hail stones or coarse salt. This week's event is being hosted by Zorra. Find out about the homeland of the Brussels Waffles. Travel guide to Brussels. Features information on hotels, apartments, sights and entertainment in Brussels. I think Thomas Jefferson was the most facinating president of all time. He was brillant, creative, ingenius, diplomatic, and popular. Leave it to him to bring waffles to his country. In our family, waffles were not for breakfast but a supper dish. Served with butter and syrup. Hi Libby, I'm so glad you stopped by. I'm fascinated by the life of Thomas Jefferson. He was a brilliant man. I hope you visit us again. Funny you should say they are a U.S. invention - we lived in Belgium for a short while and I didn't remember them!! I soooo want to try the Liege waffles...I've never had them this way and they sound amazing. Thanks for the history thrown in...love to learn something new! Oh my Mary, this is so interesting and wonderful. Reading the recipe, you're right, you can't make these on a whim. I don't own a waffle iron,but I need to start looking into purchasing one. We live relatively close to Monitcello and I am so anxious to go there. My bother has been and he's posted some beautiful pictures on his blog. Thanks for sharing these recipes, Mary. I'll be in Brussels in two weeks and can't wait to try the waffles. I know I'll be eager to make them myself when I get home. TJ is indeed a very very wise guy to like waffles. he's my hero. These look wonderful! I love waffles and hardly make them anymore. I must get my iron out! Oh, goodness. Every time I read your blog, I think of running away from home and stowing myself away in a cupboard of your kitchen! I always learn so much from your posts - you know a bit about everything it seems. The waffles look amazing. Love the waffles, cooked to perfection! Chunks of sugar...well that does sound good. Andreas, welcome to One Perfect Bite. I hope you'll become a regular visitor. I used to have a waffle iron and don't know what possessed me to give it up. But then I didn't know that you could make them with yeast! So beautiful. Hey, Sue aren't you supposed to be on vacation? Thanks for stopping by. I'm sure, that I will try your recipe very soon. Mary, waffles are a fav around here and I'm always on the lookout for new or different recipes. I first made Liège waffles about a year and a half ago and was impressed with the caramelised pearl sugar in them. Finally got around to blogging about them back in January. I'm glad to see someone else makes them, too! Oh these look so good. I have waffles on the brain ever since trying some sweet potato Belgian waffles while I was in Atlanta. Now, in addition to trying to recreate those, I can add these to the list. What is the pearl sugar and how do I make it or where can I find it? - the recipe said to see above but it was the first time that it was mentioned in the post. Liege waffles are the absolute best!!! Laurie G, you are absolutely right. I decided not to use pearl sugar in the first recipe but did not remove the reference in the second. Pearl sugar is sometimes called hail sugar because it is similar in size. It can also be likened to the size of coarse sea salt. It can be purchased in some places but anyone can make it by coarsely crushing sugar cubes. I have wanted to make these....Where did you buy your pearl sugar?, and you used a regular old wafle maker? I live in USA :) AMAZING! This was AMAZING!exactly what I was looking for. At the farmers market the waffle man sells these waffles with powdered sugar on them & I wanted to duplicate his recipe and here it is! THANK YOU! I love these waffles, I can't wait to make them myself! But as I was looking at other recipe's I noticed that they said that you only had to leave the sponge to rise for about 30 minutes. I am asking because I am a bit pressed for time. Would it be okay if I just let it rest for about 40 minutes? Thank you. Have you ever tried savory belgian waffles? there are like opened face sandwiches and taste great! Take the Brussel's waffle recipe, omit the sugar, and replace 1 cup of milk with 1 cup of water or 1 cup of Beer (yes Beer is full of yeast, which makes the waffle batter really light!). You can then enjoy the waffle with toppings such as: cream cheese and smoked salmon (like Bagel and Lox), or chicken salad, or prosciutto...really anything goes! Mary, thank you so much for the Liege waffle recipe. As always, it is PERFECT and just what I was looking for! Amazing. Your recipes never disappoint! You are so reliable for good recipes! PS- Can I ask what the purpose of the baking powder is in this recipe? I was just in Brussels for Christmas. The waffles were amazing and the best thing I have ever eaten. This recipe does NOT taste anything like what I had in Belgium.